Is This The BEST Hot Chocolate? What do you consider to be the best hot chocolate you've ever tasted? Just the thought of those memories brings a smile to my lips and makes me feel incredibly loved even now. 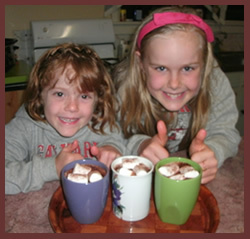 She used to add those mini marshmallows to the top for added fun and enjoyment, too. 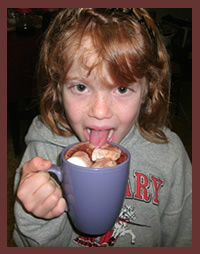 Maybe your personal favorite hot chocolate was one you splurged on when you were out at a special restaurant or cafe. Because I absolutely love chocolate (hot or cold), I always find it difficult to choose my favorites when someone asks. Having said that, I have to tell you about my recent experience with Ghirardelli hot chocolate. 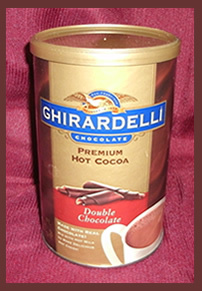 My friends at Ghirardelli chocolate recently blessed me with a canister of their Double Chocolate Hot Cocoa to try (Thanks Tammy!). The timing was perfect because we are enjoying winter here in Australia at the moment. I don't have any children of my own to make hot chocolate memories with, but I do happen to have some lovely friends who let me "share" their kids from time to time. Aren't they beautiful? What fun we had making, tasting, and photographing our little chocolate adventure. I've made and drunk a lot of hot chocolate over the years - instant, homemade, with water, with milk, flavored, etc. Some were horrid and others were delectable. I'm lucky enough to have a Thermomix, so it was a breeze to heat the milk to 80 degrees Celsius and blend in the Ghirardelli hot chocolate mix without having to stand over the stove with an eagle eye making sure I didn't scorch the milk. Sorry to say, they don't sell mini-marshmallows here in Australia (I'm deprived, I know!) ;) but never fear, I just happened to have some large marshmallows on hand from the last time the girls were over for a visit (roasting marshmallows, of course). We plopped three big beauties in each of our mugs and sprinkled some chocolate powder on top, just for good measure and to make it look cute. And then we dove in - tongues first! 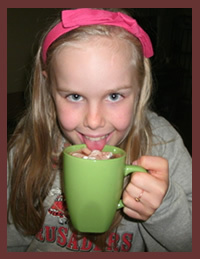 Poor Kenzie ended up with a scalded tongue, but she still declared the Ghirardelli hot chocolate to be the best hot chocolate in the world. What was my opinion? The truth is I was amazed at how rich and chocolatey the Ghirardelli double chocolate hot cocoa turned out to be. I'm one who LOVES sweet/rich - so I was surprised to find that it was a bit too sweet for me made according to the instructions. Maybe my palate has changed slightly since living in Australia as their foods tend to be much more tame/bland than ours in the US when it comes to flavor. Either way, I decided that my next mug of Ghirardelli hot chocolate was going to be made using less of the double chocolate cocoa powder per serving. So, is Ghirardelli hot chocolate the best hot chocolate I've ever tasted? No. I have to reserve that hallowed spot for my mom's homemade hot cocoa. But since I don't have mom around any more, this will definitely do. 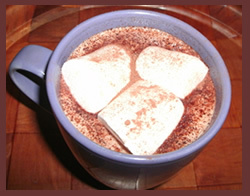 If you haven't tried Ghirardelli's hot cocoa mix, I urge you to give it a try. Winter's just around the corner for most of you, so stock up and be prepared. They have a few different flavors to choose from, so you really can't go wrong. I've included a selection of hot chocolate below - some from Ghirardelli as well as some others that you may want to taste test. If you do, be sure to tell us all about it. Which do you think is the BEST hot chocolate ever?